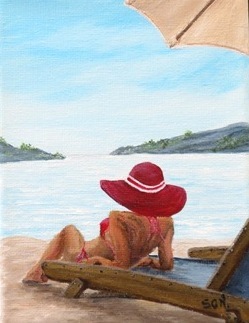 An acrylic painting on canvas, showing a lovely lady, sunbathing on a beach, looking out to see and dreaming of things to come. A mini art in acrylic, measuring 8.75" x 6.75" (22 x 17cm). Small enough to fit into any size room whether big or small, effective enough to be noticed by all. Framed in a natural wood box frame, with a certificate of authentication on the reverse, and signed by the artist.